At the U of I George lettered in basketball and baseball several times and like his brother Wally, joined the Tau Kappa Epsilon social fraternity. In 1915 George was finally heavy enough for football coach Zuppke to allow him to play in the backfield. His season ended early when his jaw was broken in two places. That summer George returned home to work at the Western Electric Company’s Hawthorne Works in Cicero, Illinois, and play on the factory’s baseball team. On Saturday, July 24, he and hundreds of other employees were to board ships on the Chicago River to attend a company picnic in Michigan City, Indiana. Halas was scheduled to be on the first ship, the Eastland, but arrived late and thus avoided being one of the 220 casualties that morning when the ship rolled over into the river. However, the Chicago Tribune printed his name in the list of employees missing and presumed dead. Two of his TEKE fraternity brothers got quite a shock when then went to his home to pay their condolences and were greeted at the door by George. In October 1916 he was teamed at halfback with future Bears partner Dutch Sternaman. Within a few weeks his season again ended when his ankle was broken. In June of 1917 Halas reportedly received an offer to play baseball for the Chicago White Sox but according to the Chicago Tribune, “passed it up to finish school.” That fall he returned to the U of I but perhaps because the United States had now entered World War I he may have had second thoughts about going out for football as he didn’t report to Coach Zuppke until after September 17th. He eventually suited up and in mid-season was moved from halfback to end. For the first time in his college career he played a full football season and won his varsity letter. In the midst of the Illini basketball season, team captain George Halas enlisted in the U.S. Navy and on January 18, 1918 became Carpenter’s Mate Second Class at the Great Lakes Naval Training School. [The University of Illinois waived the last semester of class work for Halas and other service men who left school before graduation. Therefore he received a degree in civil engineering and was considered an alumnus of the Class of 1918.] By early February he was now playing guard for the Blue Jackets basketball team alongside former U of I hoops teammate John Felmley. Several months later Halas graduated from Officer Candidate School, was commissioned as an ensign and was playing center field for the “Jackies” baseball squad. When fall arrived he joined the naval base football team with future Staley teammates Hugh Blacklock, Jerry Jones, Emmett Keefe, Jimmy Conzelman and life-long associate Paddy Driscoll. Playing against some of the best college teams in the country the Blue Jackets won 6 and tied 2 and were sent to the Rose Bowl against the undefeated Mare Island Marines. On January 1, 1919, Great Lakes defeated the Marines 17 – 0. Halas caught a pass and ran for a touchdown and later intercepted a pass and returned it 77 yards before running out of gas and getting tackled. He was given the game MVP award and still holds the Rose Bowl record for the longest non-scoring pass interception return. With the war now over, Halas was discharged from the Navy in February 1919 after 14 months of service. Early that month the Chicago Tribune printed two articles speculating on his future. On February 4 American League Umpire Billy Evans stated that Halas had just signed a contract with the New York Yankees and that this young man would be a hit in center field if given the chance to develop. Said Evans, “Halas is a big fellow, standing nearly six feet, and weighing about 180 pounds. He is fast and a daring slider…. He hits the turf hard and at full speed, and on reaching the bag is instantly on his feet.” The news story on February 10 revealed that Great Lakes football stars Halas and Driscoll planned to play professional baseball that year but then “will pass up their chances for further athletic fame at the close of the 1919 baseball season to accept opportunities in business. Both athletes have agreed to go to South America about Nov. 1 to hold positions with Armour & Co. in a tannery and hide plant which is to be established in Buenos Aires.” This opportunity came about from fellow Great Lakes football player J.K. Mosser, an Armour meatpacking executive in his civilian life. Halas reported to Jacksonville, Florida for spring training where the “daring slider” ironically hurt his hip sliding into third base. Although hampered by the injury he moved north with the Yankees as an outfielder and pinch runner. His first of only 12 big league games was on May 6, 1919, when he batted leadoff with the now famous baseball footnote Wally Pipp playing first base and batting cleanup. With 22 major league at bats, but only 2 hits, he played his last Yankee game July 5 despite having his bad hip cured in Youngstown, Ohio by the legendary sports doctor John D. “Bonesetter” Reese. The now 164- pound switch hitter was sent down to the minor league Saint Paul Saints team in Minnesota where he hit a respectable .274 in 39 games before returning to Chicago to work as a bridge engineer for the Chicago, Burlington, and Quincy Railroad for fifty-five dollars a week. Instead of heading to South America for employment that fall as earlier reported, Halas stayed with his railroad job and by October also had been recruited to play football once a week for the semi-professional Hammond [Indiana] All Stars along with fellow navy buddies Driscoll, Keefe, Jones and Blacklock. They played most of their games on Sundays at Cubs Park [now Wrigley Field] before 3000 to 10,000 fans with most players receiving $100 in cash per game. The last game of the 1919 season was November 27 against Jim Thorpe and his Canton Bulldogs. Canton won 7 – 0 and Halas was sent to the hospital in the 4th quarter with a broken collarbone. On February 25, 1920, the Decatur Herald reported that George Halas had been released from the New York Yankees and assigned to the minor league team in St. Paul. Halas did not like the diminishment in pay and refused to play in Minnesota for less money than he received in his previous year’s contract. The next time Halas’ name surfaced in the Decatur press was on March 19 when the Review reported “George ‘Chic’ Halas Joins Staley Forces.” Halas later recalled that A.E. Staley had sent factory executive George Chamberlain to Chicago to offer him a job at the starch plant and the chance to organize a high-level industrial league football team. Halas agreed as long as Mr. Staley would let him recruit players who would get paid for working at the plant, get release time daily for practice and get a get a percentage of the revenue from games. Within a few days Halas quit his railroad job and was in Decatur being trained as a “scale house clerk” responsible for weighing deliveries of corn. In addition, he got paid $50 a week and became the second baseman on the Staley baseball club team. The Staley baseball team was managed by former major league pitcher “Iron Man” Joe McGinnity and included future major league player and manager Charlie Dressen and future Bears and Cubs trainer Andy Lotshaw. Halas was named Captain of the team and when the season ended on September 26, led the team in hits, runs scored, stolen bases and batting with a .315 average. The June 1920 Staley Journal ran a photo of Halas batting left handed along with a photo of the team with Halas standing next to A. E Staley. Over the next two years, Halas always appeared next to the boss or in the most prominent position in any group photo. In July the Journal reported that Halas and Jake Lanum went on a week’s “scouting trip” the previous month to various Big Ten schools looking for football players. Former U of I teammate Dutch Sternaman was the first to be signed. As soon as each recruit moved to Decatur that summer they became fully integrated in Staley social and recreational activities; serving on committees for picnics, dances, and track meets and participating in the annual Staley Fellowship Games. On Thursday, September 16, 1920, Halas and Staley engineer Morgan O’Brien took the train to Canton, Ohio to meet with other club team members in order to form some sort of football league. They hoped this group would agree to rules about poaching opposing team players, restrict the use of college players and help coordinate scheduling games. Halas was later fond of retelling how the group met on Friday in Ralph Hay’s Hupmobile auto showroom and that he sat on an auto running board while they elected Jim Thorpe as president of the new American Professional Football Association. The Staley representatives immediately returned home so Halas could play baseball on Sunday. Football practice started that Monday, September 20, 1920. Halas managed, coached and played left end. The team started with a scrimmage against the Millikin University varsity on Tuesday, September 29 on the Millikin field. Their first real game was October 3, 1920 against the Moline Tractors. Between 1500 and 2000 fans watched on the Staley baseball field as the Starchmen won 20-0. The following Sunday, Decatur beat the Kewanee Walworths as Halas limped along the sideline with a sprained ankle. It would be the only game he would miss in the two years of his Staley career despite breaking a cheek bone later that month in Rockford. All in all, 26 different men appeared in at least part of the 13 games played that season. At least one man practiced all season and never appeared in a game. Except for a few easy games there were very few substitutions and starters played the game on both offense and defense. If an exhibition against the Champaign American Legion Team is counted, the team’s record was 10 wins, 1 loss and 2 ties. The only loss, 6-7, came in the third game of playing 3 games in 8 days. The Staleys at 10-1-2 claimed the league championship. However, each club had played various games against non-league opponents and at a league meeting on April 30, 1921, the Akron (Pros) at 8-0-3 were awarded the championship. A week after their last 1920 Staley football game Halas and the team hosted A.E. Staley and several executives to a banquet at the St. Nicholas Hotel in Decatur. It was reported that each player had received their bonus money from the games. For all of his extra duties Halas received $2,372.77, well over $700 more than any other player’s share. 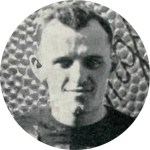 He and three other Staley linemen then went to Chicago and were paid to play for the lowly Chicago Stayms football team on Sunday, December 19 against Paddy Driscoll’s Chicago Cardinals. This would mark the only time that Halas ever played or coached against an NFL legacy franchise without being a member of the Staleys or Bears. At the start of 1921 Halas continued working at Staleys. He played on the industrial indoor baseball league team, tried to organize a barnstorming basketball team and even gathered a group of his old gang to play an indoor football game on January 15 in Chicago’s Dexter Park Pavilion. The February 1921 Staley Journal reported that the “Western Champions” – “Played One Game of Indoor Football and Decided That Once Was Enough for Them.” He was soon promoted to “Athletic Director” for the company and then had another outstanding year playing 77 baseball games during the 1921 season. When the 1921 football season started with a 35-0 exhibition blowout over the Waukegan American Legion team on October 2, Halas had completely revamped the team. Gone were all but two local men and all but one regular Staley employee. Added were ten college stars from Ohio, Indiana and New York. After the team’s October 10 victory over Rock Island on Staley Field, A.E. Staley brought George Halas into his office and made him an offer he couldn’t refuse. If Halas and his players agreed to keep and respect the Staley name for the rest of the season, the company would pay up to $5000 to support their football team. The team was to stay in Chicago starting with their next game and players no longer had to work in the Decatur factory. Halas agreed and immediately made arrangements with Chicago Cubs management to use Cubs Park for their daily practices and the remainder of their home games. The team then moved into the Blackwood Apartment Hotel and played 8 of their last 10 games in 1921 in the future Wrigley Field, averaging about 7000 fans per game. The team’s record was 10-1-1 and they were awarded the APFA Championship, much to the chagrin of New York’s Buffalo All-Americans. Early in 1922 Halas and teammate Edward Sternaman agreed to become partners to maintain the now Chicago football team franchise. They changed the name from the Staleys to the Bears. Later that year the professional football association changed its name to the National Football League. Another partnership took place that year when on February 18 George Halas married his high school sweetheart Wilhelmina “Minnie” Bushing. While the Halas-Sternaman partnership ended in 1931, the George-Min partnership is still responsible for the current Bears ownership. In the mid-1930s “Papa Bear” Halas started having yearly reunions of his former players near the end of each football season. Staley players were always invited. In October 1956 Halas and the Bears honored the A.E. Staley Company and the Staley football players during the halftime of a home game at Wrigley Field. George Halas proclaimed that without A.E. Staley there would never have been the Chicago Bears. In 1983 George Halas was diagnosed with pancreatic cancer. He died that year on Halloween at the age of 88. He was buried in the family Mausoleum at Saint Adalbert Cemetery in Niles, Illinois. George Halas won his 8th and last league championship as a coach in 1963 with Mike Ditka as a player on that team. According to Steve Delsohn’s Da Bears! How the 1985 Monsters of the Midway Became the Greatest Team in NFL History, before his death in 1983 Halas gave now Bears coach Mike Ditka a bottle of champagne and told him not to open it until the team won the Super Bowl. On January 26, 1986, the Bears had their 9th league title and Ditka drank from that bottle.